I didn’t know how to explain something so basic! Imagine a life without the smell of fresh clean hands! My jaw dropped and my mind was blown. I was meeting children who had lived their whole lives without something I had been taking for granted all my life. Soap is so critical because beyond keeping us clean and smelling nice, it actually saves lives. Diarrhea and pneumonia are the biggest killers of children in the developing world, taking the lives of almost 3.5 million children each year. Yet, they don’t have to die: diarrhea and pneumonia are both PREVENTABLE. How? Soap! It’s a low cost, low tech solution to preventing childhood deaths — more effective and cheaper than any vaccine. The most basic form of preventive medicine in the world. And yet, in this day and age, there are still millions of children who lack access to soap. Unilever estimates there are 70 million just in India alone. Can you imagine? 7 New York Cities full of people who have never used soap! 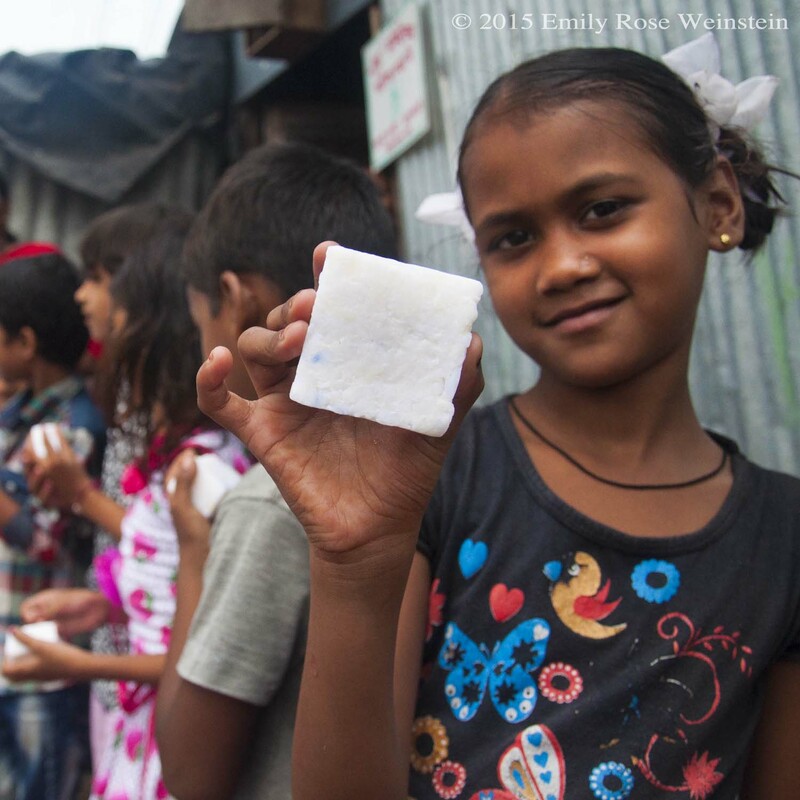 Recycled soap can help young girls reap the benefits of clean hands. Meanwhile every year over a billion bars of soap go straight into landfills. The biggest culprit? The hospitality industry. We’ve all been to hotels that replace our bar soap daily or ditch the partially used soap left behind in showers. Have you ever stopped to think where those little bars wind up? That’s where Sundara Fund comes in: we connect the waste to the need. We run sustainable soap recycling initiatives in India, Myanmar, and Uganda. We hire local slum women to collect bar soap waste from hotels, process it into new bars of hygienic soap, and distribute it to children in need, while teaching about the benefits of hand washing and basic hygiene. Our operation involves a simple process that takes less than 10 minutes! Used bar soap that would otherwise be thrown into the trash is collected from our hotel partners. The soap is shaved down, cleaned with a chemical solution to ensure it does not contain any disease, and then compacted into a new bar that is donated by Diversey/Sealed Air. The soap is distributed to schools, health clinics, orphanages, and youth detention centers along with hygiene education for each child who receives soap, ensuring that these good habits stick. To date, we have saved 25,600 kg of soap waste, made 67,800 new bars of soap, and taught 2,334 hygiene education classes—impacting 10,000 people (including 6,000 children). Our hygiene ambassadors are given fair wage jobs that lift them out of poverty, the slum residents are provided with regular deliveries of sustainable soap and hygiene education, and we help the environment by diverting tons of waste from landfills. Sundara Fund empowers Uganda’s Margaret Nalubega with fair wages to recycle soap and help save lives. Here’s a great example of how Sundara is positively affecting communities and the lives of its workers. Margaret Nalubega is Sundara’s oldest employee in Uganda. She cares for 2 of her children and 7 of her grandchildren, all in her own house that she has built out of cow dung, sticks, and mud. She also lost a finger to infection. Sundara saw in Margaret a willingness to work hard, promote health, and empower the community. In particular she loves distributing the recycled soap to her neighbors and teaching them about hygiene. “Maybe if I had learned these things earlier then my finger would still be here,” she wonders. With her regular salary that she gets from recycling soap and working on the weekends at Bukompe camp as a hygiene ambassador, she has done something she always thought would have been impossible: she has been able to pay the school fees of all 7 of her grandchildren. At age 57, Margaret is breaking the cycle of poverty. Do your homework. The next time you are searching for a hotel, find out if they have a soap-recycling initiative similar to Sundara’s. If they don’t, you can likely assume your barely used bar of soap will be thrown into the trash. Please consider leaving a note for housekeeping not to replace with a new bar. Spread the word. Teach your own children the importance of clean hands and hygiene education. Underscore how some children do not even know what soap is, so that they understand how privileged we are when we have access to this most basic form of medicine. Awareness of this issue is the first step towards making a real change. #ThinkTwice before you shop. Buy products from ethical soap companies like Soapbox, b.a.r.e. soaps and Lavender Court, which support our programs in India, Uganda, and Myanmar. Remember that your purchases have power — you can choose to do good even when you are buying household products. Donate. Sponsor a child to receive soap deliveries and hygiene education for just $30. It might be less than you spend for dinner tonight. Please consider supporting our work at the Sundara Fund here: https://donatenow.networkforgood.org/sundarafund, and we promise to give you updates of the communities you are actively making healthier. Erin Zaikis is the founder of Sundara (www.sundarafund.org), a nonprofit that runs sustainable soap recycling programs in developing countries. Wow, Erin this amazing – such an innovative solution. I try not to use the complimentary products at hotels because of the waste… and I’m so glad to hear you’ve found a solution (at least for the soap)! I’ve found the same issue here in many places in Vietnam – no soap! Thanks for your work. I hope your program continues to grow. It seems to me that so much of our waste comes from the effort to make things invisible to us- like soap! I also think of all the packaging that those individual soaps are wrapped in. How much waste does that create? This is awesome! I never use bars of soap in hotels due to unnecessary waste. I am wondering if the next step in this recycling journey could be to recycle unused liquid cleaning products as well to bring even more hygiene products to those who truly need it. After reading your article, I am now thinking of taking used soap with me if there is no soap recycling project at the hotel. Like this, I can pass it on to people living on the streets. I used to do give away the food I could not finish at the restaurants but I never really thought about the fact that people living on the streets are also in need of hygienic products. Thank you! This is a great solution to a problem often overlooked. Women in developing nations are often overlooked in the global marketplace but their contributions can be grand and far reaching. I look forward to hearing about how these women continue to expand their learned knowledge to their children, villages, and local marketplaces. Agreed! It is so important to involve locals in initiatives such as these! I really admire and appreciate the many issues tackled with this single program. I especially love that the hospitality industry is the target here, as I feel they have such a pressure to create waste in order to provide each guest with new amenities. This waste buildup is even more worrisome, however, as I reflect back on a cross country trip I once went on, where it was near impossible to find a hotel that even recycled your typical recyclable items! But this article serves as a reminder that almost anything, even soap, can be recycled. This is fantastic – congrats, Erin, on starting this important initiative! Similar to another commenter above, I was also thinking about the little liquid soaps used in hotels, and was wondering how these could be recycled. Of course, the fact that these come in bottles means that there is more waste too them, and a risk that they may not be properly disposed. I wonder if it’s possible to turn liquid soap into a bar of soap to prevent the additional waste? I’m not sure what the science would be behind that, but it could be worth looking into. In our modern lives, we often take for granted some of the most basic necessities that so many others are denied. Living in the developed world and its accompanying wealth make it so easy to forget how those abroad are forced to live in squalor. The work of the Sundara Fund is inspiring; by empowering women to help their communities, some of the most environmentally denigrated regions can be lifted and finally capitalize on the benefits of hygiene and beyond. I was just having this thought of unfortunate waste on a recent trip to Savannah. What a simple but incredibly innovative way to reduce waste while simultaneously solving a major health issue. I always feel that many people are shocked to hear that dehydration and diarrheal diseases are among the biggest killers of many countries in Africa and Asia since they can be solved with such simple hygiene practices. But after living in Madagascar for 3 months last year (which isn’t as challenged with hygiene as many of its neighboring countries in mainland Africa), I can see how access to these simple solutions is much harder to implement than it is in America. However, this initiative is a great way to solve that problem! I only wish there was a more practical way to transport all the thrown away soaps from the U.S. over to those countries in need (without all of the pollution of travel). This is a brilliant idea. How many times do we leave behind half-used soap from a hotel visit! I love that it can be made use of. It’s great to see an organization that involves the residents of local communities in their work – especially women, who obviously face larger obstacles because of their gender. It is too often that aid is given without any contribution or collaboration with the locality. This also shows how drastically many people take for granted the simplest of resources! It is clear that the most basic materials can make the biggest difference. Great article! What I think is so powerful about this initiative is that it is truly tackling two problems at once: employment and hygiene. In the short term, for the same amount of effort, it is possible that just as many children could have gained access to soap from a large scale donation from the United States. However, by investing in a solution rather than a one time donation, this initiative is providing a long term sustainable solution that boosts both the health and the economy of developing areas. This is such an inspiring article and really goes to show that a small idea can make a big difference. It gets me thinking about the importance of not just waste reduction but of teaching. It’s amazing that a bar of soap and a quick lesson on personal hygiene can go such a long way. I agree with Emily in that it’s incredible that this is able to provide health, knowledge AND employment. The whole initiative is incredibly sustainable in every sense of the word. This is such a great strategy to help create effective hygiene in third-world countries. The hotel industry in general is very wasteful especially with the disposable hygiene products such as shampoo, conditioner, lotion, etc. Reusing this soap is a great way to reduce our waste and aid nations that do not have the resources to provide hygiene products. During my winter break I was in Honduras for a service trip and I had noticed that many restaurants, residencies, and other facilities did not have toilet paper or soap provided. This amenity I took for granted and did not realize in other nations it was viewed somewhat as a luxury. This program will definitely benefit the impoverished communities and ensure they are receiving basic hygiene. I like that you mentioned that soap has use way beyond just keeping us smelling fresh and clean, but that it can actually save lives. Access to soap as a disinfectant could save countless lives in the developing world. My wife and I have been looking for ways to help those who are less fortunate than us. Recycling soap could be a great option, I will have look into it. I see you’ve got your own way of ‘recycling soap’. Feel free to add another comment letting us all know more about your and your wife’s invention. Wow, it’s never crossed my mind that the hospitality industry would be the biggest culprit behind soap waste. I wonder if similar initiatives are being taken in cities like NYC, Beijing, and London. I predict sustainable hotels will become the standard of hospitality in a few years. Thanks for sharing, Emily! Wow What a reality check. This initiative is truly beautiful. I really appreciated reading about Margaret who was able to earn a fair wage delivering soap and was able to pay for schooling for her 7 grandchildren! Who would have known that soap would make such a difference in so many people’s lives just through Margaret alone! Really inspiring! Keep up the amazing work! Erin, truly an inspirational program! Using such a personal experience to start the Sundara Fund and create change makes it all the more special. Also, I was uninformed of the lack of access to soap in developing countries. I recently took a course called Global Public Health that focused on poverty and economic disparities between developed and developing countries, and not once was this solution brought up as a simple and cost effective way to prevent harmful diseases. It is very smart to implement community outreach and female empowerment into the goals of the Sundara Fund. I would say empowering women and providing families with more opportunities contributes as much to the community as the soap itself does. I encourage you to advertise on social media as much as possible! As someone who cares about health issues and female equality I would appreciate the opportunity, as well as plenty of others would, to learn more about your initiatives and be proactive in the ways you suggested! Wow- I have never thought about the concept of recycling soap. This initiative is so inspiring and one I am definitely going to look more into. We take so many things for granted like hygiene something as simple as soap. This post was very eye-opening and informative. Thanks!